SAN DIEGO, CA–(Marketwire – Jan 4, 2013) – Medistem Inc. ( PINKSHEETS : MEDS ) today issues the following letter to shareholders. 2012 was marked by significant progress in the development of the Endometrial Regenerative Cell (ERC), our new universal donor “stem cell drug.” Most significantly, we initiated a double blind, placebo controlled clinical study in patients with end stage heart failure, in which ERC were administered via the Medistem’s patent-pending minimally invasive procedure. The clinical trial comprises three escalating doses of ERC with cohorts of 20 patients per dose. To date 14 patients have been treated with no adverse effects, thus demonstrating feasibility of the administration procedure, as well as safety of the cells. Because it is a double blind study, efficacy will not be known until the trial is completed. The clinical trial is being conducted at the Backulev Center for Cardiovascular Surgery in Moscow, Russia, by Academician Leo Bockeria. The company also initiated a 15 patient critical limb ischemia trial in China in collaboration with Shanghai Jia Fu Medical Apparatus Inc. To date two patients have been treated. The trial is based on the Medistem critical limb ischemia study that has been cleared by the FDA. In addition, we licensed from Yale University the world-wide rights for a patent application using ERC to treat Type 1 diabetes. We also initiated a program in type 1 diabetes, with the goal of filing an Investigational New Drug application before the end of 2013 to allow for clinical trial initiation. In addition, our intellectual property was further enhanced with the issuance of patent #8,241,621 covering the use of fat derived stem cells for treatment of autoimmune conditions such as rheumatoid arthritis, type 1 diabetes, and multiple sclerosis. We have also filed 2 patent applications covering the use of ERC for radiation protection and treatment of traumatic brain injury. Also, in collaboration with several corporate and academic institutions we published a total of 7 peer reviewed papers in 2012 on collaborative breakthroughs we made in the areas of hepatitis, cancer, and prevention of transplant rejection. Additionally, this year we added two new advisory board members including Gene Ray, Ph.D., and Alexander Gershman, M.D., Ph.D. Dr. Ray was founder of the Titan Corporation, where he served as CEO and a director of the corporation since the company’s inception in 1981. In 2011, Titan Corporation was acquired by L-3 Communications for $2.6 billion. Dr. Gershman is one of the first surgeons in the world to apply the method of laparoscopic surgery and robotic-assisted surgery to urology. He currently holds several hospital appointments, including: Director of Institute of Advanced Urology at the Cedars-Sinai Medical Center; Director of Urologic Laparoscopy in the Division of Urology, and Harbor-UCLA Medical Center. Finally, this year marked a major transition in the leadership of the company. I was appointed to the position of CEO on October 26 and Dr. Thomas Ichim transitioned to the position of President and Chief Scientific Officer. Dr. Ichim has done an outstanding job leading the company for the past four years and I look forward to working closely with him at commercializing the ERC product. •Filing an IND for type 1 diabetes. 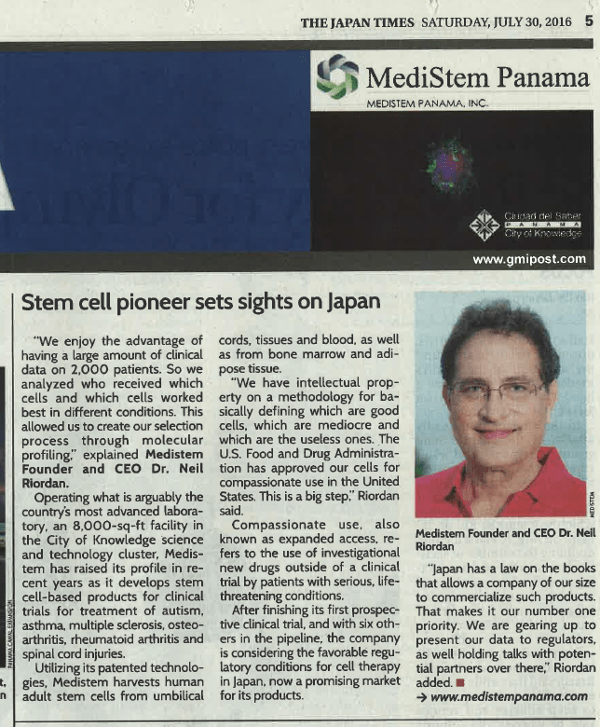 Medistem Inc. is focused on the development of the Endometrial Regenerative Cell (ERC), a universal donor adult stem cell product. ERCs possess specialized abilities to stimulate new blood vessel growth and can differentiate into lung, liver, heart, brain, bone, cartilage, fat and pancreatic tissue. These unique properties have applications for treatment of critical limb ischemia (CLI), congestive heart failure (CHF), neurodegenerative diseases, liver failure, kidney failure, and diabetes. ERCs have been cleared by the FDA to begin studies in the United States. 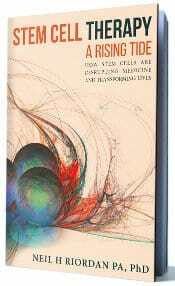 ERCs have several distinguishing advantages to other stem cell therapies: a) Non-invasive method of collection; b) Unlimited supply of cells; isolated from menstrual blood of young healthy donors; c) Economical and scalable to manufacture; d) Exert higher therapeutic activity compared to other stem cells; and e) demonstrated safe in animal and pilot human studies. As Kenny Kelley of Glenburn awaits an infusion of adult stem cells at a Panamanian city in November 2011, a Panamanian physician holds two syringes containing the cells. Autistic since birth, Kenny has undergone several such infusions since 2009. Posted Sept. 14, 2012, at 12:17 p.m.
GLENBURN — Now Kenny can read. Kenny Kelley can now also do many things that other 11-year-olds take for granted. According to his mother, Marty Kelley, that’s because injections of adult stem cells, taken from umbilical cord blood, have helped Kenny to shake off the shackles of autism, with which he was first diagnosed at age 2. Autism is a brain disorder found in children that interferes with their ability to communicate and relate to other people. Autism affects 1 in 88 children and 1 in 54 boys. What causes autism has not been established. Stem cells are the body’s internal repair system and can fix and replace damaged tissue. These unspecialized cells are a blank slate, capable of transforming into muscle cells, blood cells, and brain cells. Stem cells can also renew themselves by dividing and giving rise to more stem cells. Stem cells taken from umbilical cord blood, such as Kenny received, are the least likely to be rejected. The stem-cell treatment is the latest effort by Marty and her husband, Donald, to find ways to improve Kenny’s life. The Kelleys also have two other children: Philip, 13, and Caroline-Grace, 6. First was in-home treatment in a mild hyperbaric oxygen chamber, three hours a day equaling 800 hours over the course of two years, beginning when Kenny was 5 ½ to 6 years old. This was coupled with a Specific Carbohydrate Diet, which restricts the use of complex carbohydrates and eliminates refined sugar and all grains and starch from the diet. Then the Kelleys discovered on the Internet the story of Matthew Faiella, a New York boy who has been making great strides after stem-cell treatment in Panama for his autism. They decided to follow suit. Why take this path, when there has been little scientific research into the use of stem cells to treat autism? • Behavior: Screaming, aggressive, giggles/silly/inappropriate with his brother or new people, running around, destructive, uncooperative while being dressed, hitting, not potty trained (still wearing diapers). • Speech: Vocabulary of a 4-year-old. He can talk, but it is difficult for strangers to understand him. Answers some questions, but he does not understand or like why, when, or how questions. • Physical: A body the size of a 5-year-old boy. Kenny has had stem-cell treatments in 2009, 2010, and May and November of 2011. The repeated treatments are required because adult stems cells will work repairing cells for a period of time, about six months, then leave the body. “When I think I’ve seen his skills level out, we’ll go for another treatment,” explained Marty. What are some of the changes that Kenny has undergone in the past three years? First came the ability to read and clearer speech. Other gains: Kenny is talking about past events for the first time, and he’s conversational now. He expresses opinions and looking ahead to the future. He was finally potty trained at age 9. He’s doing math now. He’s calmed down considerably. This summer, he went to summer camp, staying overnight for three nights, in the same cabin as Philip. The costly treatment, which isn’t covered by insurance, hasn’t been approved yet by the Food and Drug Administration. Despite the fact that the stem cells come from the human body, the cells are considered a new drug by the FDA and are subject to stringent research and testing that can take years. So this leaves the Kelleys and others like them seeking stem-cell treatment, going overseas to get it. SAN DIEGO, CA — (Marketwire) — 09/12/12 — Medistem Inc. (PINKSHEETS: MEDS) announced today completion of the first phase of a joint project with the Shumakov Research Center of Transplantology and Artificial Organs of the Russian Federation and its Russian and CIS licensee ERCell. The collaboration is based on using Endometrial Regenerative Cell (ERC) technology licensed from Yale University to treat type 1 diabetes. Dr. Viktor Sevastianov, Head and Professor of the Institute of Biomedical Research and Technology, within the Shumakov Center, demonstrated safety and feasibility of ERC injection in experimental animal models of diabetes. Additionally, the studies demonstrated that the cell delivery technology developed by Dr. Sevastianov’s laboratory can be used to enhance growth of ERC. These experiments are part of the process for registration of “new pharmacological substances,” which is the first step towards drug approval in Russia. Medistem discovered ERCs in 2007, and they appear to possess “universal donor” properties, allowing the cells derived from one donor can treat multiple unrelated recipients. According to Medistem’s current FDA cleared production scheme, one donor can generate 20,000 patient doses. Medistem licensed technology from Yale University for generating insulin producing cells from ERC. A publication describing the technology may be found at http://www.ncbi.nlm.nih.gov/pubmed/21878900. “Our vision is to combine SpheroGel, which is a clinically-available cell delivery vehicle in Russia, together with Medistem’s ERC and technology from Yale University to generate a commercially-viable product for clinical trials in type 1 diabetes patients,” said Thomas Ichim, CEO of Medistem. Medistem has outlicensed the Russian and CIS rights to ERC and related products to ERCell LLC, a St. Petersburg-based biotechnology company. Under the agreement, Medistem owns all data generated and will receive milestone and royalty payments. Cautionary Statement This press release does not constitute an offer to sell or a solicitation of an offer to buy any of our securities. This press release may contain certain forward-looking statements within the meaning of Section 27A of the Securities Act of 1933, as amended, and Section 21E of the Securities Exchange Act of 1934, as amended. Forward-looking statements are inherently subject to risks and uncertainties, some of which cannot be predicted or quantified. Future events and actual results could differ materially from those set forth in, contemplated by, or underlying the forward-looking information. Factors which may cause actual results to differ from our forward-looking statements are discussed in our Form 10-K for the year ended December 31, 2007 as filed with the Securities and Exchange Commission. More progress reported on the treatment of heart disease with endometrial stem cells. 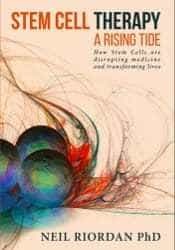 Neil Riordan, PhD is one of the early pioneers of endometrial stem cell technology. Dr. Riordan is also the Founder and President of the Stem Cell Institute in Panama City, Panama. SAN DIEGO, CA–(Marketwire – Jun 4, 2012) – Medistem Inc. (PINKSHEETS: MEDS) announced today positive safety data from the first 5 patients enrolled in the Non-Revascularizable IschEmic Cardiomyopathy treated with Retrograde COronary Sinus Venous DElivery of Cell TheRapy (RECOVER-ERC) trial. The clinical trial uses the company’s “Universal Donor” Endometrial Regenerative Cells (ERC) to treat Congestive Heart Failure (CHF). According to the study design, after 5 patients enter the trial, they must be observed for a two month time period before additional patients are allowed to enter the study. Patient data was analyzed by the study’s independent Data Safety Monitoring Board (DSMB), which concluded that based on lack of adverse effects, the study be allowed to continue recruitment. “Medistem is developing a treatment for CHF that uses a 30-minute catheter-based procedure to administer the ERC stem cell into the patients’ hearts. The achievement of 2 month patient follow-up with no adverse events is a strong signal for us that our new approach to this terrible condition is feasible,” said Thomas Ichim, CEO of Medistem. The RECOVER-ERC trial will treat a total of 60 patients with end-stage heart failure with three concentrations of ERC stem cells or placebo. The clinical trial is being conducted by Dr. Leo Bockeria, Chairman of the Backulev Centre for Cardiovascular Surgery, in collaboration with Dr. Amit Patel, Director of Clinical Regenerative Medicine at University of Utah. “As a professional drug developer, I am very optimistic of a stem cell product that can be used as a drug. The ERC stem cell can be stored frozen indefinitely, does not need matching with donors, and can be injected in a simple 30-minute procedure into the heart,” said Dr. Sergey Sablin, Vice President of Medistem and co-founder of the multi-billion dollar NASDAQ company Medivation. Currently patients with end-stage heart failure, such as the ones enrolled in the RECOVER-ERC study, have no option except for heart transplantation, which is limited by side effects and lack of donors. In contrast to other stem cells, ERC can be manufactured inexpensively, do not require tissue matching, and can be administered in a minimally-invasive manner. Animal experiments suggest ERC are more potent than other stem cell sources at restoring heart function. The FDA has approved a clinical trial of ERC in treatment of critical limb ischemia in the USA. Medistem Inc. is a biotechnology company developing technologies related to adult stem cell extraction, manipulation, and use for treating inflammatory and degenerative diseases. The company’s lead product, the endometrial regenerative cell (ERC), is a “universal donor” stem cell being developed for critical limb ischemia and heart failure. A publication describing the support for use of ERC for this condition may be found at http://www.translational-medicine.com/content/pdf/1479-5876-6-45.pdf. 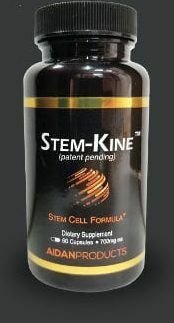 SAN DIEGO, CA, Mar 07, 2012 (MARKETWIRE via COMTEX) — Medistem Inc. (pinksheets:MEDS) and Yale University have signed an exclusive worldwide licensing agreement covering the generation of pancreatic islets from stem cells such as the Endometrial Regenerative Cell (ERC). These pancreatic islets have effectively treated diabetes in animal models. Professor Hugh Taylor of Yale University, inventor of the technology, made international headlines in September 2011 when he published his findings in the peer-reviewed journal Molecular Therapy. Medistem is currently in two clinical trials with ERCs: One for critical limb ischemia and a second for congestive heart failure, both of which are complications of uncontrolled diabetes. About Medistem Inc. Medistem Inc. is a biotechnology company developing technologies related to adult stem cell extraction, manipulation, and use for treating inflammatory and degenerative diseases. The company’s lead product, the endometrial regenerative cell (ERC), is a “universal donor” stem cell being developed for critical limb ischemia and congestive heart failure. A publication describing the support for use of ERC for this condition may be found at http://www.translational-medicine.com/content/pdf/1479-5876-6-45.pdf . ERC can be purchased for scientific use through Medistem’s collaborator, General Biotechnology http://www.gnrlbiotech.com/?page=catalog_endometrial_regenerative_cells .